A child who experiences getting hate responses or extreme humiliation on the digital space is one form of cyberbullying. 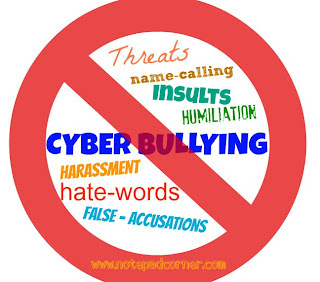 Cyberbullies are rampant in the internet especially on the social networking sites and emails too. As there is a high penetration rate of kids using the internet on a daily basis, the risk of cyberbullying is also heightened. Cyberbullies deliberately harm people in a repeated and more often in a hostile manner wherein they intentionally send harassing emails or instant messages on one’s social network account. Cyberbullying can cause severe stress, depression and anxiety among today’s youth that could lead to fatal consequences. There are a lot of reported cyberbullying incidents in the recent newspaper accounts. Just the thought of our child be a victim of these cyberbullies is already a nightmare for a parent like me. Here are some suggested ways to protect a child from being cyberbullied. Watch out for your kid’s sudden change in behavior after turning off his computer. He may become moody, angry or abnormally silent keeping his distance from the family. As I always said in my past posts communication is the key. Talk to your child and listen carefully to what he says so the problem may be resolved soonest before it gets any bigger. If your child is active in different social networks, you have to make sure that you add him as a family into your account, thus you will also be able to monitor the responses he is getting from his own timeline. But of course, we also have to make sure that we do not intrude on his social network activities, keeping an eye is enough. Find out what exactly disturbs him and show support, explain the term cyberbullying and if he happens to be teasing someone online, make him understand that it is never right to bash or offend someone online or otherwise, at the same time explain the unfavorable consequences of his action. Give him guidance on the proper netiquette (network etiquette). Block inappropriate sites for kids. Instruct them not to reply from unknown email senders, it is just the same with what we always remind them of do not talk to strangers. We ought not to deprive children of the joy of learning, exploration and entertainment that could be found in the digital space, we just have to encourage and help them find safe sites then regulate the time they spent in the computer.